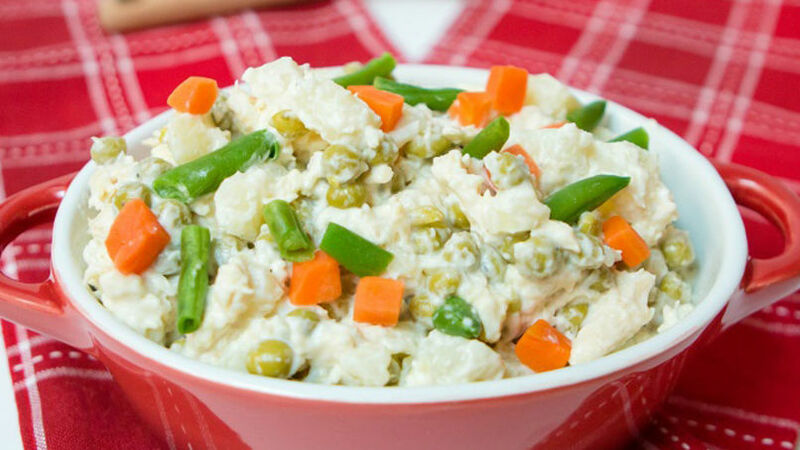 In a large bowl, mix the gallina, potatoes, onion, sweet peas, green beans and carrot. In a separate small bowl, combine the mayonnaise, mustard and olive oil. Add the mayonnaise blend to the gallina mixture. Stir carefully until all the ingredients are well incorporated. Chicken can also be used in place of gallina. If you like, add one cup diced apples to give a unique toque to your recipe. An ensalada de gallina, or chicken salad, is never missing from a Venezuelan table at Christmas time-my mother makes the best one! The flavors of our typical holiday dishes like hallacas, chicken salad, pernil and pan de jamón are truly unique. Ever since we arrived in the United States, we've tried making other types of meals during the holidays, but we always return to our home cooking. The original recipe for preparing this salad uses gallina, an older hen that lays eggs and not the young chickens sold in the market. But in these modern times, it's not so easy to find one; you'll actually see that it's very common to substitute regular chicken for the gallina. Honestly, I can't tell too much difference; they're both delicious!